This time of year is a puzzling one for dressing. One moment you’re loafing about the house, relaxing the waistband after a festive dinner with the family, and the next you’re heading out to a holiday party, franticly trying to get those damned trousers to button again. While the later has been written about ad nauseam (by myself amongst others), its the former I want to focus on here. How to dress casually, but elegantly is, I think, the true test of style – and not just at the holidays. A gentleman typically looks his best in black tie. It’s slimming, makes one look taller, creates symmetry of the figure, and especially in our ultra-casual modernity, it adds an heir of distinction to even the plainest of men. I won’t disparage the art of great black tie, believe me, but I will say that for the style-initiates that haunt places like Men’s Flair, it’s not tough to look great. In fact, it’s hard not to. Now when dressing casually, there are quite a few things to be considered. 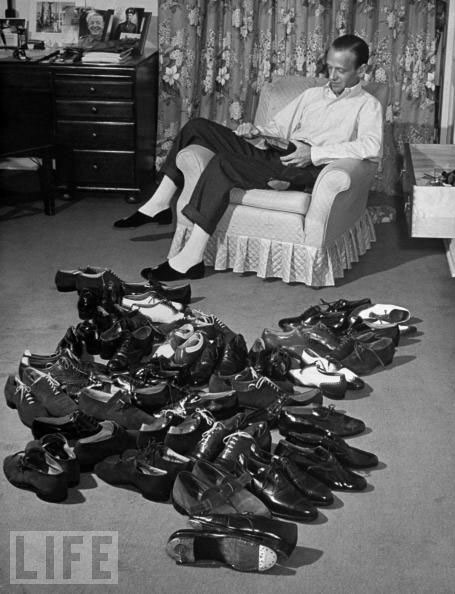 First off, you should not only feel comfortable, but look comfortable – just like Mr. Astaire above. Cloths should be softer and jackets and trousers cut ever-so-slightly less close. Generally the colors and patterns that dominate country dressing take over for the sobriety of city garb, even if the holiday dinner is spent around a table on the 40th floor of a metropolitan apartment building. The trick, in my experience, is to find a balance between ease and effort. Living on a college campus, I don’t spend as much time “dressed up” as I would like, but I get a lot of opportunities for smart casual. Walking to class in pinstriped worsted cut like a razor would just make me look foolish, but I do typically find myself in some mixture of tailoring and more causal attire. The key is keeping things pulled together, even if the elements are each relaxed on their own. Their is a tendency to decide you’re having a “casual day” and to just throw things together haphazardly, but this only looks sloppy, not casual. I personally have my own peccadilloes as well when it comes to dressing down. There is a particular pair of trousers I own that are old flannels handed down to me by my father, but they are a size too big for me. Maybe a size and a half. But, I often pull them on when running to get a bagel in the morning, or, when I lazily slide out of bed lacking the time to dress properly, they end up doing more than helping me satisfy my early-morning hunger. They look quite terrible, especially from behind, but I’m human and it happens. More advantageously, because I spend most of my time dressed fairly casually, I have a decent array of corduroy trousers, worn-in chinos, and variably shaded grey flannels, along with quite a few “soft-washed” tattersall shirts to see me through most days. I resist the urge to go for the pyjama-like pants and instead dress with deliberate choices. And, unless I’m deluding myself, I think I look alright doing so. So when you’re relaxing by the fire, or running errands at the weekend, ditch the suit and pull of something soft and casual. Sounds funny coming from me, but trust me, I’m sure you’ll look dashing. Stephen blogs at thesimplyrefined.com. Striving always for elegance and excellence, Stephen believes that whether it be dress, drink or diversion, it should be considered, explored, and enjoyed.